I hate trying out new hotkeys, mainly because there is no way to know what is taking up my existing hotkeys! I do use Marek's hotkey tool but that only tells me if a particular hotkey is in use; not what it is for. I feel the same pain But didn't Marek say there's no reliable general way to extract that information from Windows? Yeah, but I keep hoping that someone finds one! I suppose hotkey is something you press so often until you can't forget. Hey, I have a LOT of software! (Just ask Darwin). And so many damn hotkeys that some are truly automatic. Sometimes I don’t even realize that one has been changed until I (automatically/unconsciously) try to use it and am suddenly surprised when another program window opens instead. It's NOT virtual folders, which contain (Listary-generated, Listary-managed) "links" (not used as a technical term here) to files from various folders, grouped together here (as we have in various file managers, but where these "virtual folders" are not managed in any really practical way (want to have quick access? even when you have 25 of such virtual, "project" folders? see what I mean? )), but Listary 4's "projects" seem to be just normal, physical folders in which you copy (! good look with your versioning efforts!) files from other folders, or into which you move files from other folders (which means that in their original folder, they are not available anymore for any other "projects" or within their "reference context" (since you took it out from there)). I tried the "virtual folder" management of XYplorer, of Xplorer2, of Director Yopus, and of Speed Commander, and in view of the above, I wasn't delighted. Does anybody know better such / more practical "virtual folder" implementation in any file management tool, or did I even misunderstand the "project" feature in Listary? Did I even misunderstand the "project" feature in Listary? I think you may indeed have misunderstood Listary's projects. A project is a keyword that limits Listary's search to a single drive / folder or a collection of folders. Example: I like to search my music collection which is spread over 2 drives in 3 folders. I add an entry for each folder in the projects view and give them all the same keyword "mu" as an abbreviation of "music". Then I search "mu jackson" to see only files and folders from my music collection (the 3 folders defined earlier) that contain the word jackson. NOTE: Listary does include favourites - bookmarked folders to which you want to gain access with only one click or minimal typing, but this is quite separate from 'projects'. I'm not sure about Quick Jump, but Listary seems to be "per user" rather than per computer. Thank you very much, kunkel321 - obviously, I didn't understand their explications, but I instantly understand yours! It's not a coincidence, I've been looking at bits for days, where it had been marked as "upcoming", but you're perfectly right, it's on sale there at this very moment (had looked this morning last time, but too early...). So it's even more imminent, but in fact, I'm dubitive if I really have to bloat my system with another application just for "having it got for almost nothing". In fact, I had mused about their "projects", thinking, "but they got shortcuts to folders anyway, so what? perhaps it's a different group of shortcuts?" - thanks again for explaining. But then, I believe to know that in the past, they only got finds (files) from your current folder, and then integrated "Everywhere" (no, the other one, what is it called again? public domain? free, at least), into Listary, in order to make it find files in every folder (before, people hat used both, in combination, which is now not necessary anymore). So, the "projects" feature is simply a means to avoid a maximum of false finds being pulled into the list, since you search by name PARTS (which is a very good thing indeed), but by the price of not getting some wanted hits that are spread (yet) in some other folders not included in your respective "project". Oh, oh, I remember that QuickJump is expected to LEARN from your use (and that's why I refrained from trialling them both - wasn't in the mood to install them both, one for 3 weeks, then the other for 3 weeks), which means some sort of "artificial intelligence", again for avoiding unwanted finds (and if I understand well, in QuickJump's case, by pushing lesser probable hits to the bottom of the list you'll get). And I wrongly assumed (without really thinking about it) that Listary functions the same way, whilst in fact, as soon as you understand Listary's "project" concept, you understand there's no ai in Listary, but either you get the long, long list, unsorted by probable relevance, or you fiddle with "projects" and risk to not have some hits you might dearly want - and then, it's clearly a mixing up of tagging and sorting, which is another conceptual problem. But at this price... right? Is there anyone who knows any virtual folders manager? Both bits from bits. Please vote the bits dumbo of the month. Just Bought the software. I have been using free version for a long time now. But want to support the company as this is really a software that helps you save time and navigate quickly where you want. You must buy it, really. Direct access to latest folders and preferred folders. Change your life. I purchased Listary Pro v 3 on 12/17/2011 from BitsDuJour. I don't know if this purchase was for lifetime upgrades? I see now you have a new version 4 on BitsDuJour with lifetime upgrades. I did download the new version 4 and installed it over the old version 3 and it did take the serial number. Does that mean that my purchase was for lifetime upgrades back then? I: plus 1 for b but an honorable mention to a's superb goodwill. A virtual note means that the contents of this note are not stored in the database file, but instead in an external file, the location of which is set in the "URL" field of the note properties. Working with virtual notes allows you to centralise your work with a number of files that may be scattered in different locations on your computer. Neither should you overlook the fact that Listary is free for personal use, with bonus features in the payware Pro, and that it has a portable version. Therefore you can try out some features without cost or the tedium of a full installation. I think Listary is terrific; my only regret is that it wasn't invented earlier. Two of the killer features are its ability to integrate Windows' standard File Open/Save dialog with the vastly greater convenience of several important file managers, like my own favourite Total Commander. Use your FM to point your text editor or whatever to the directory and file you want. Back in the days when I was using WinXP at work and having to edit series of hundreds of PDFs with Foxit PDF Editor, I had to continually open files in turn- and having to find where I'd left off. Listary puts the cursor on the current one, so you can continue easily. I don't know what recent versions of Windows are like in that respect, but back then that alone would have been worth the price of entry. Where do you find the above info: use the same keyword to group entries? SORRY AGAIN, AMPA, see above. rjbull and tomos,thank you both very much for your kind hints. In fact, I also tried these, and if I may give an advice here (while hoping for somebody else having something better to "offer"), these "scrap containers" by xplorer2 are the best solution so far: They are independent windows that can be placed "always on top" if needed, sized down to rather tiny sizes, and thus can be shown, too, when the xplorer2 window is minimized = hidden. The content (the link list) is saved into a file, and you can load these special files into these containers, which means, instead of having many such little panes cluttering your screen, you should have one such pane, and switch these special list display files (".cida" files) there, by macro: A little menu with 20 cida files, to be loaded into a single container. I just made up this idea in this moment - seems to be, by far, the best way to do it today, since it avoids the necessity to switch between a file manager and your main programs, a text editor and your main programs, or an outliner and your main programs. tomos, you say, "I use an outliner myself with linked files - with mixed success." Oh yeah! The problem here is that either you switch between the outliner tree (with its links) and your main program, or even when the outliner is your main program, any link triggered will hide your current project tree, with those links, and you have to switch again, back and forth: your project is not in continuous visibility. That's why I've being searching for "better", without finding something, except, now, this ".cida" file switching in a narrow pane, which means your main application will NOT be displayed in a maximized window anymore - and, as said in the other thread, there's no manual rearranging of entries, except for deleting them and then reimporting your links, one by one, in a certain order, and with the setting "no automatic sorting": not good! but such links are managable if your list doesn't get too long. Other problem, you cannot bold or color your links in such a pane, for example for reminding what's needed today, what's needed tomorrow, etc., or for doing subgroups, by colors - all this is possible with the links within an outliner tree, let alone the manual rearrangement which is without problem there! And the developer of xplorer2 is not responsive, doesn't even see what he's got there, so a little bit tweaking might be so helpful for his business. Years ago, there was "Virtual Folder", then renamed to "Virtual Disk". See both sites, virtualfolder.net and virtualdisk.net. From their graphic appearance, you would think these sites are well and alive, modern, working. When in fact both sites have been out of business for four years now. Try their "buy" buttons, and you'll see what I mean, and that's been persistent since 2009! So, a tiny little application did exist, but before my becoming aware of it, and today, it's really xplorer2 the only possibility to have such a list at hand, here depending on a full file manager, but without that being visible - perhaps with DO, it's similar, that you can hide the main window, but just display one such "lister", so that would make it two. And then, there is tagging programs, of course, some even with tiny windows. Tagging, by the way, does not let you manually rearrange items, either (that's another advantages of trees over tagging: not the (wanted) subordination effect (levels), but also, just ordering items of equal indentation level) - tagging does not do this, but produces unordered (or then, alphabetically "ordered" / in fact alphabetically mixed up item lists). As for Virtual Folder / Virtual Disk, I suppose they would not offer such (persistent) manual rearranging either (and lately, I checked Speed Commander for this, too: it doesn't do it, and then, you'd have the whole big Speed Commander window in front of you, instead of your respective main application). I'll let pass Listary an nth time: The "back to previous" functionality can be replicated by macros (storing variables), the "find as you type" functionality seems to be better implemented in QuickJump (didn't DonL say his XYplorer will have this functionality soon, in some post some months ago?) (and Listary's example for "fuzzy search" is horrible, would bring thousands of false hits in real life) - and yes, rjbull, you're right, I complain because Listary isn't a project manager "in the sense that I want it to be", or let's be frank, it's not a project manager at all; Tabbles is terrible, by the way, another complaint of mine: Yes, they make promises that in real life don't hold. P.S. In fact, it's incredible that in 2013, there is not a single file manager, not a single extra tool, that allows for putting links in a list, AND allows for shifting entries around, for formatting them (bold, italics, underline), and for coloring them. BUT I just think that I didn't try 1-pane outliners for this, so far, or a 2-pane outliner where you would hide the text field, by pushing it beyond the right border of your screen. And I tried ListPro for this (last week on bits), with not much success, but should try again (my criteria were different at the time). But what a fuss! And this makes me remember the existence of "To-Do" tools, just little list things, the more minimalistic the better: They are written to help you in prioritizing and grouping, so it's here that the solution to this problem will probably lie - it seems I was too much focussed on file "managers" of all sorts, when in fact, "To-Do managers" will probably have on offer much more acceptable solutions! it's an interesting idea. It's definitely worth starting a new thread though - would get a better response in it's own thread. I didn't find the information anywhere, I just tried it, and it worked. Seemed obvious to me that was how the feature should work, but I admit it could be made a bit more explicit! As for management of the various projects and associated folders: I agree that the current system is rather basic, as one will end up with an ever growing unordered list of entries. I suggest discussing with Channing (the author). I have chatted with him about various Listary issues. I've always found him to be very interested / committed / supportive. Update 1: So I went ahead and made a post on the Listary forums. We'll see what Channing says. Update 2: Channing has replied to my suggestions, and it looks like Project management will be getting an upgrade in the next version. See thread in update 1 for details. For my a little bit amateurish comparison between Listary and QuickJump, I have positive news for Listary, though. In fact, I always made the difference between search for content, and just search for file and folder names, never mixed those up. But as incredible as it seems, QuickJump only searches for folder names, not file names, too (when I didn't think the necessary ">" sign in Listary for that was elegant, especially since it's three additional key pressings, shift-< and space). So this is a completely new situation: The thing so much more expensive just does "a third" of what Listary does. My excuses to Channing, I wasn't keen to manipulate, I just didn't know any better. Thus rectification. Going into details helps, for not triggering false expectations (here, for QuickJump). Please download the portable version of Listary and try it yourself. No installation needed, and all Pro features are available for free trial (with some nag screens of course), you don't need to pay a single penny. I'm sorry if Projects doesn't work in the way you expected, but your other judgments about Listary may be incorrect. Find as you type is a unique feature of Listary that is not available in any other application. It allows you to type the search term directly (without a hotkey) in your favorite file manager. Currently Windows Explorer, open/save file dialogs, XYplorer and xplorer2 are supported. Directory Opus will be supported next week (GPSoftware is kind enough to release a new version to support Listary). Sorry that I don't know what this is. In most cases, what you're looking for is ranked top. Google always brings millions if not billions of false hits, but we really don't care because we know only the first few pages are useful. For my a little bit amateurish comparison between Listary and QuickJump, I have positive news for Listary, though. In fact, I always made the difference between search for content, and just search for file and folder names, never mixed those up. But as incredible as it seems, QuickJump only searches for folder names, not file names, too. Listary can search all your drives for files and folders by filename within 0.1 second literally (it takes Listary 0.085s to search my 1,200,000 files on 4 harddisks). I believe none of the other applications you mentioned can do this. It seems that you need to add folders to QuickJump manually for indexing. (when I didn't think the necessary ">" sign in Listary for that was elegant, especially since it's three additional key pressings, shift-< and space). 1. You only need the leading ">" if you want to search across all drives. Without it Listary will search within your current folder (which is what you need in most situations). 2. The space after ">" is not required. 3. You can change ">" in Listary Options to something like "/" to save the "Shift". @Channing: I'm a DOpus user. If I buy a licence at BdJ today, will I get the Listary update with the DOPus support next week? Yes. You'll get life-time updates for free. I still recommend you try it first. You can reassign the Win + S hotkey to something like Ctrl + Shift + S easily in Listary Options - Hotkeys. Channing, thanks very much for posting this. I've ignored the info DOpus has been sending about new versions, since they're beta, and I tend not to mess with beta versions. As a result, I had no idea that DOpus would soon support Listary. As a very happy user of DOpus and Listary, I'm delighted to know about this. I just wanted to say thanks for being active in the discussion here. I just found the support section of the Listary page http://discussions.listary.com/ so I'll post my questions there. i assume this is where the custom apps go, but how do i add one? i don't see the 'add' button. 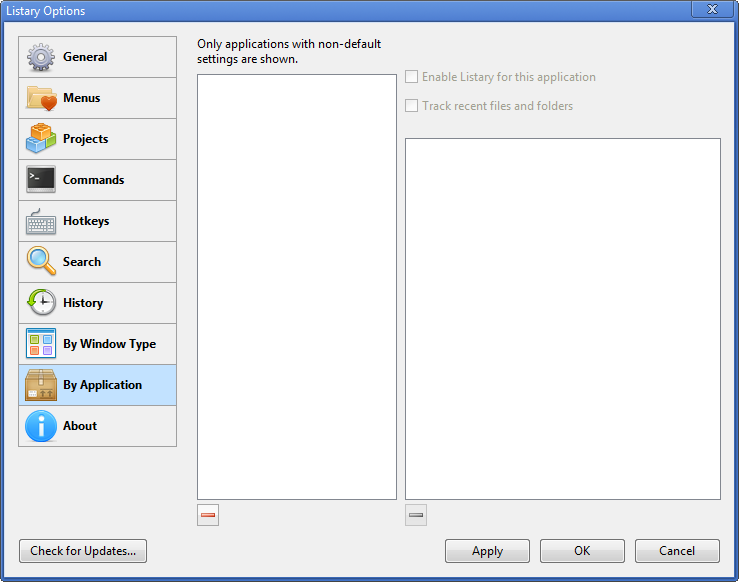 Listary 4 doesn't support adding custom applications Which application you'd like to add?